Just a really quick post. We leave for Hawaii dark and early in the morning...6:50 am flight. So I will be up hopefully around 4. We are going for my sister-in-laws wedding, but turned it into a family vacation. Long way to go, so why not?! So excited and can't wait. I wanted to share the very cute album and announcement I made for her. First the album, I used a plain Martha Stuart album (on clearance at Michaels) and decorated the front. I'm going to have everyone send me pics and I will make pages to fill it and send to her. Love the saying, and the flowers were a STEAL at $1.99 for a whole bottle! The "G" hanging from the ribbon is their monogram. Well here they are, and as always, thanks for looking! 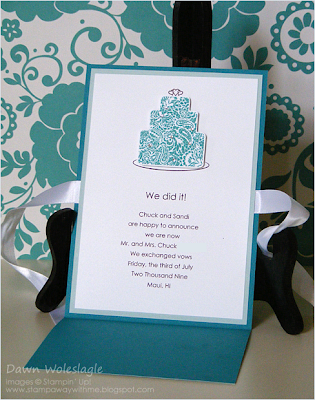 Next, since it is a destination wedding, and not everyone could attend, I also created her a neat little wedding announcement that she can mail out to the rest of friends and family. 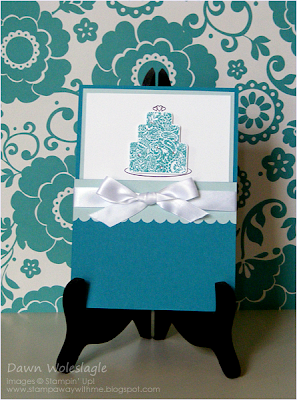 Their wedding colors are teal and sky. I think I did pretty good matching them if I do say so myself. I just love it when a plan comes together, don't you? 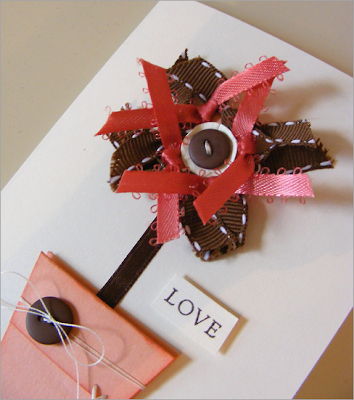 I had the idea to make a flower using ribbon scraps, and had to try it out. 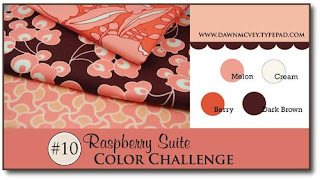 Now, these aren't really scraps, since I happened to see that Dawn McVey had posted a new color challenge, but I wanted to try it out. And I have to say I really really like it. And won't it look so cute with tons of all colored ribbons?! 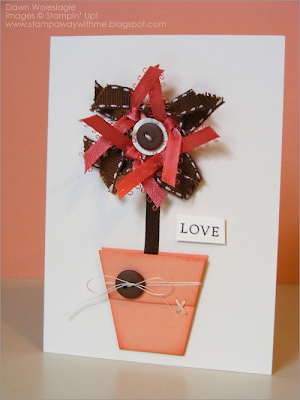 This is my "scrappy" card though, as I don't remember where any of the bits and pieces of product came from. LOL The only SU! 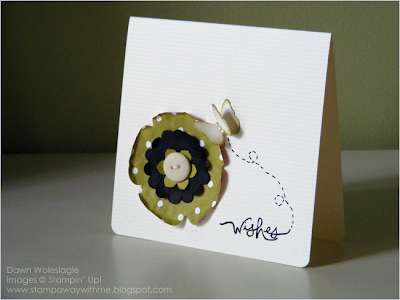 on this card is the sentiment stamp and the Chocolate Chip ink. Oh and the inside says "...you!" Hope you enjoy! What a wonderful day. I hope everyone enjoyed their Father's Day. We had a fun filled day on the boat, and then docked at a local resturant for dinner. Lot's of fun! 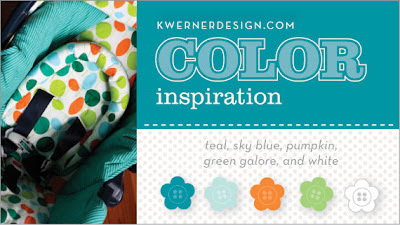 On to Color Inspiration Challeng #55. I actually made this night last, but for some reason our internet access was down all morning. So I'm posting now. 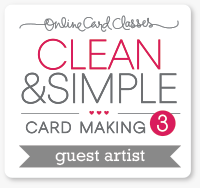 This card came together very quickly once I figured out what I wanted to do. I got to ink up the new SU! 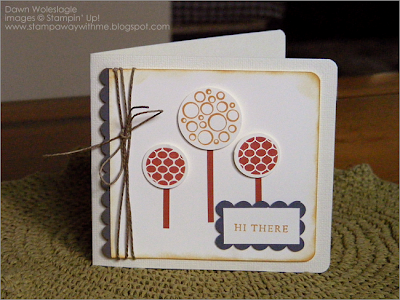 stamp set Circle Circus, available July 1st. I really like this set. 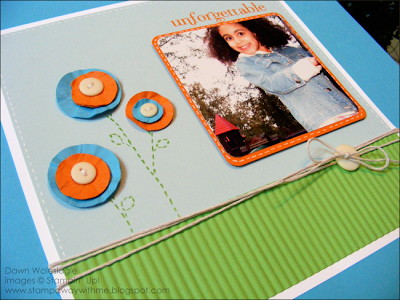 I saw the stamp set used in the Stampin' Success mag and I think they were supposed to look like flowers, and I thought...hmmm....why not trees. I love how it turned out. Also, I cut a custom sized scallop rectangle. A neat trick was also featured in the mag about how to turn corners with the lace edge punch, and I just had to see if it worked for the scallop edge punch as well. And with a little trial and error, it did! The colors used were SU! 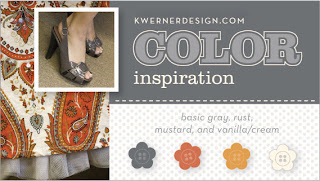 's More Mustard, Basic Gray, Really Rust, and Very Vanilla. 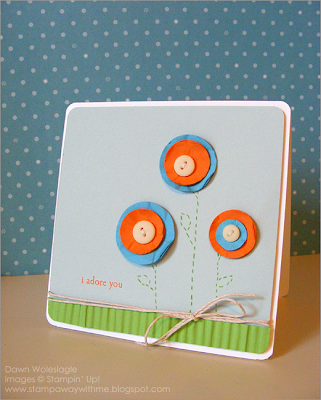 For some reason I had the hardest time photographing this card, the colors just wouldn't capture correctly. No amount of post-editing was working. Oh well, hope you enjoy! Geez, I am just feeling these bright sunny colors lately...maybe it has something to do with the impending HAWAII vacation!!! In the spirit of vacation, I pulled out these photos of my hubby and I from just after vacation last summer. I love these photos, such good times! The page was pretty simple and came together quickly. I took some of the SU! Pink Flamingo DSP and cut out a portion of the flowers. I also pulled out the SU! Circle Scissors Plus to cut out the 6 inch circle. The letters were something I found on clearance at Michaels...can't remember the brand. 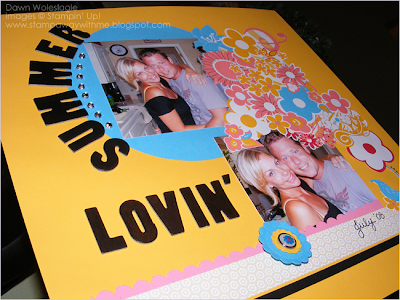 I finished it off with some fun rhinestones and a little journaling and voila, Summer Lovin'! Thanks so much for looking and hope you have a wonderful weekend. 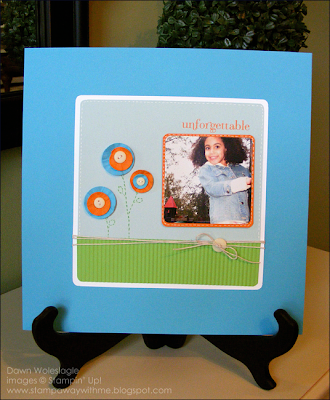 Not too clear in the photo, but the cream cardstock is textured with horizontal lines running through it. Not the best for stamping. I inked up just the word "wishes" from SU! 's Heard From the Heart set and stamped the sentiment. I then used a roller ball pen to trace over it and fill in where the stamp didn't take. Have a great night and thanks for looking! Wow, things just never seem to slow down, do they? 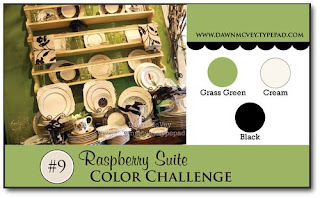 I was so excited when I saw the colors for Kristina's Color Challenge. My niece's birthday is coming up fast, and I needed to make her a card. The colors match her personality perfectly! 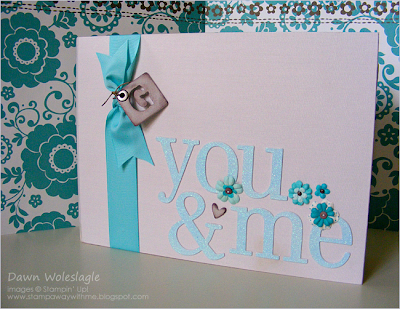 Although silly me mis-read and used turquoise instead of teal...it still counts, right? !